In 1979 Glidrose Publications (now Ian Fleming Publications) approached John Gardner and asked him to revive Ian Fleming’s James Bond series of novels. 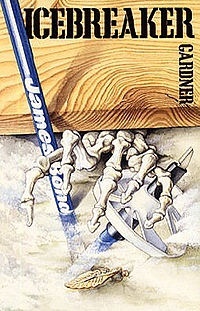 Between 1981 and 1996, Gardner wrote fourteen James Bond novels, and the novelizations of two Bond films. Gardner stated that he wanted “to bring Mr Bond into the 1980s”, although he retained the ages of the characters as they were when Fleming had left them. During this period, the book dust jackets continued in the same vein that Richard Chopping had started during the Fleming years, even creating the first Gardner artwork for Licence Renewed. 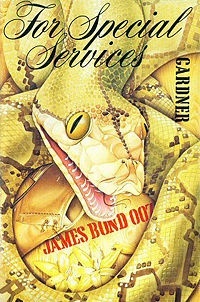 Successfully relaunched the Bond literary franchise, being the first of 14 original novels by Gardner until his retirement in 1996. In that time frame Gardner also wrote two novelizations. 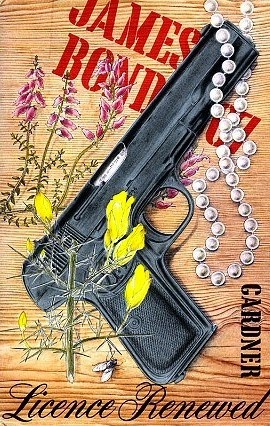 The cover featured many of the traditionally associated elements of the previous James Bond novels: A gun, flowers and Chopping’s signature fly. The handgun featured is Bond’s own FN model 1903 from the novel, which replaces the Walther PPK, and the flowers are heather and wild iris, to indicate the Scottish setting. First published in 1982, was the second novel by John Gardner featuring Ian Fleming’s secret agent, James Bond. Carrying the Glidrose Publications copyright, it was first published in the United Kingdom by Jonathan Cape and in the United States by Coward, McCann & Geoghegan. Botten picks up where Chopping left off with italicized font for the title and the classic Tea Crate font for the author and series names. Lovely detail of the snake and the flower motif can be seen at the bottom. First published in 1983, was the third novel by John Gardner featuring Ian Fleming’s secret agent, James Bond. Carrying the Glidrose Publications copyright, it was first published in the United Kingdom by Jonathan Cape and was the first Bond novel to be published in the United States by Putnam, beginning a long-standing association. The skeletal hand is reminiscent of the Thunderball cover by Chopping and Botten returns to the classic wood background used by Chopping with Tea Crate font. 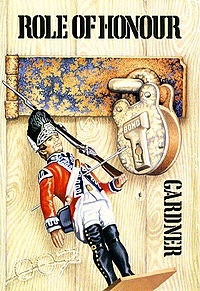 (published in American editions as Role of Honor), first published in 1984, was the fourth novel by John Gardner featuring Ian Fleming’s secret agent, James Bond. Carrying the Glidrose Publications copyright, it was first published in the United Kingdom by Jonathan Cape and in the United States by Putnam. Trevor Scobie‘s fabulous design for John Gardner’s Role Of Honour in itself a great homage to Richard Chopping. Lovely detail on the padlock and wood background; probably the best and closest example of the Trompe L’oeil style used in a continuation novel. (published in American editions as Nobody Lives Forever), first published in 1986, was the fifth novel by John Gardner featuring Ian Fleming’s secret agent, James Bond. Carrying the Glidrose Publications copyright, it was first published in the United Kingdom by Jonathan Cape and in the United States by Putnam. 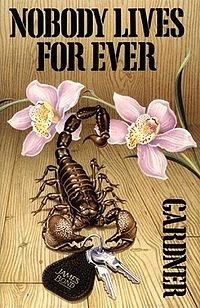 My personal favorite here is ‘Nobody Lives Forever‘ with the juxtaposition of the scorpion and flowers. They could have used a Bentley motor cars key fob in my opinion but it will do! These novels are clearly homages to Chopping’s style, and other novels such as Mark Gatiss’ ‘Black Butterfly’ also emulate Chopping’s distinctive covers.